"Dnipro Dnipropetrovsk" redirects here. For other uses, see Dnipro Dnipropetrovsk (disambiguation). Football Club Dnipro Dnipropetrovsk (Ukrainian: Футбо́льний Клуб «Дніпро́» Дніпропетро́вськ IPA: [dnʲiˈprɔ dnʲiprɔpɛˈtrɔβ̞sʲk]) is a Ukrainian professional football club based in Dnipropetrovsk. Dnipro, which is the Ukrainian name of the Dnieper river in Ukraine, is a popular sports name in Dnipropetrovsk. Beside the association football club there also is a bandy team under the same name, basketball team and others. However, FC Dnipro Dnipropetrovsk is not a multi-sport club. The club is owned by the Privat Group that also owns BC Dnipro and Budivelnyk Kyiv. During the Soviet Union the club was a member of the Soviet Volunteer Sports Society "Metallurg" (therefore it carried names Metallurg/Metalurh and Stal) and until 1961 was under sponsorship of the Petrovsky Dnipropetrovsk Metallurgical Plant. After that the club was sponsored by the Southern Machine-building Plant Yuzhmash and carried both names Russian Dnepr and Ukrainian Dnipro, while Dnepr was also used for international competitions. Before the fall of the Soviet Union, the club was the second most successful club of Ukraine that participated in the Soviet Top League, winning in 1983 and 1988. Sometime after the fall of the Soviet Union, the club was privatized. The club's franchise traces its history all the way back when the first team that was formed in 1918 by the Petrovsky factory and was called as BRIT (Brianskyi Robitnychyi Industrialnyi Tekhnikum). The team participated in the regional competition (Katerynoslav championship). With the four other teams BRIT played its games on small stadium "Sokil" which was located at the corner of Pushkin street and Yuriy Savchenko street. Due to World War I, BRIT was disbanded, but on 9 May 1925 a new team was formed in Dnipropetrovsk (coincidentally, later the day became to be known as the Victory Day). The team participated under a generic name as football team of Petrovsky factory. The official name it received in 1926 when it became to be known as "Petrovets". The team entered the first Soviet competition under the name of Stal (steel, En) in 1936 in one of the lower divisions. 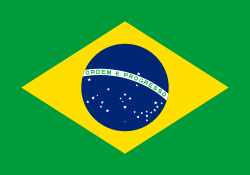 The team participated in the three championship before World War II. After the war, in 1947, the team reentered the Soviet competition and was merged with another club from Dnipropetrovsk, FC Dynamo Dnipropetrovsk. From 1949 until 1961, the team was called Metalurh (from English metal worker). 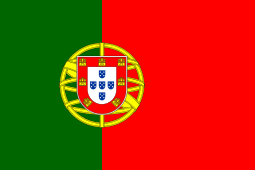 During this time the team participated for three seasons, 1950–1952, among the amateurs due to poor results. In 1954, Metalurh Dnipropetrovsk reached the semi-finals of the USSR Cup, where it lost to Spartak Yerevan. In 1961, the team was handed over to its new sponsor, the Yugmash (the Southern machine-producing factory), which at that time was one of the most powerful factories in the entire Soviet Union and was funded by the Ministry of Defense. It was part of the Zenit volunteer sports society. The new sponsor changed the team's name to the Russian name of Dnepr, Dnieper, as the Russian was the accepted language of the Soviet Union and the Soviet government. The team's performance did not change much until after 1968, when Dnepr obtained Andriy Biba and the new coach – Valery Lobanovsky. After that it took the team three years to get promoted to the Soviet Top League and eventually took sixth place in 1972. In 1973 and 1976 Dnepr reached the semi-finals of the USSR Cup competition. In 1978 the team was relegated to the lower league for two years. Their next return to the top flight was not as inviting as their first one and the team languished at the bottom of the table for several years. In the following years, the governing body of the team hired new promising coaches – Volodymyr Yemets and Hennadiy Zhizdik. After those changes, Dnepr became a strong contender for the Soviet championship winning it twice: once with Yemets and Zhizdik in 1983, and another one with Yevhen Kucherevsky in 1988. Also, in 1989 Dnepr became the first professional football club in the Soviet Union. During those years, the team featured many notable players such as Oleg Protasov, Hennadiy Lytovchenko, Oleksiy Cherednyk, and Oleh Taran. 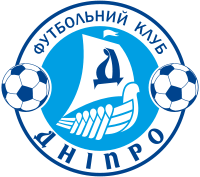 Following the collapse of the Soviet Union, the club took on the Ukrainian version name of Dnipro, the name of the biggest river and one of the major symbols of Ukraine. The club joined the football federation of the native country and remained one of the top contenders in the newly formed Ukrainian Premier League. The team received silver medals in 1993 as well as the bronze in 1992, 1995, 1996, 2001, 2004. The team also reached the Ukrainian Cup finals in 1995, 1997 and 2004, but lost all three to Shakhtar Donetsk. FC Dnipro is currently controlled by the Privat Group. On 14 May 2015, following a historical 1–0 victory over Napoli after a 1–1 draw in Italy in the semi-finals, Dnipro qualified for their first ever European final, the 2015 UEFA Europa League Final where they played defending champions Sevilla on 27 May at the Stadion Narodowy in Warsaw, Poland. Despite going up 1–0 on the 6th minute, Dnipro lost 3–2. This was one of the club's greatest successes, not just in terms of records and trophies; they were also able to inspire the residents who were suffering in war torn territories. The situation was such that during the entire course of the campaign, FC Dnipro Dnipropetrovsk had to play all of their home matches some 400 kilometres away in Kyiv due to the war. On 31 March 2016, the club was excluded by UEFA from participating in the next UEFA club competition for which it would otherwise qualify in the next three seasons (i.e. the 2016/17, 2017/18 and 2018/19 seasons) for violating the Financial Fair Play regulations. Late June 2016 rumours appeared that club owner Ihor Kolomoyskyi had stopped funding the club. Kolomoyskyi immediately denied this but did state "The club will not exist in the same form as before" and that it was "not normal to spend crazy amounts of money" on the then current squad. Since 1966 Dnipro's home was Stadium Meteor in Dnipropetrovsk. Prior to that the club played at the Matalurh Stadium (formerly Stal Stadium). Meteor Stadium was built by the Soviet rocket company Yuzhmash on the original site and has undergone several renovations since, the last one being in 2001. However, in 2002 after several spells in European competitions, it became clear that the club needed a new modern venue. Thus, in 2005 Pryvat Group started construction of Dnipro Arena in the centre of Dnipropetrovsk. 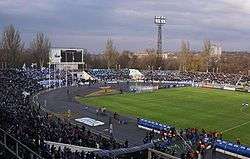 The club played its last game at Meteor on 2 September 2008, against Metalist Kharkiv. In April 2005 the club's new arena broke ground. It was constructed by Germany's largest construction company Hochtief. The construction itself took 3 years and 4 months, but a nine-month delay occurred due to a land dispute over a site where the stadium's car park was planned. The stadium's final capacity is 31,003 people and the initial estimated cost of the construction was set at €40,000,000. The stadium was opened on 15 September 2008. The opening ceremony featured a speech by Ukrainian president Victor Yushchenko, a concert performance by a number of famous Ukrainian musicians and two football matches: Veterans of Dynamo Kyiv vs Spartak Moscow veterans, and Dnipro against Dynamo Kyiv. As a present to the club from the city the street that the stadium is situated on was renamed into Kucherevskyi Boulevard, in honour of Dnipro's late coach Yevhen Kucherevskyi. Dnipro played their first official game on 29 September 2008 against their local rivals FC Metalurh Zaporizhya, but Dnipro lost 1–2. They set a new attendance record for the Ukrainian Premier League 2008–09 season, at 31,000 spectators. Since the beginning of conflict in Eastern Ukraine, Dnipro have played their European matches at the Olympic Stadium in Kyiv at the behest of UEFA, although there has been comparatively less conflict in Dnipropetrovsk than other areas. No information is known for the 2000–01 season. Dnipro Dnipropetrovsk participates in European competitions since 1984 after playing its first against Trabzonspor. Since 2001, however, the club participates almost on annual basis with variable successes. However, this was interrupted in 2016, when, despite finishing third place, Dnipro was forbidden to play in the European competitions by UEFA. Wikimedia Commons has media related to FC Dnipro Dnipropetrovsk. ↑ "Ukrainian bandy championship". Ukrainian Federation of Bandy and Rink-Bandy. Retrieved 16 May 2014. ↑ "Dnipro's Yevhen Seleznyov sinks Napoli to seal Europa League final place". Guardian. 14 May 2015. Retrieved 15 May 2015. 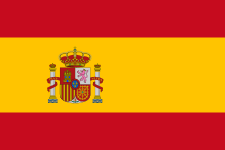 ↑ "Dnipro 2 Sevilla 3". BBC Sport. 28 May 2015. Retrieved 28 May 2015. ↑ "CFCB adjudicatory chamber orders". UEFA. 31 March 2016. 1 2 "Dnipro football team will not be liquidated, but revamped – Kolomoisky". Interfax-Ukraine. 30 June 2016. ↑ "Dnipro qualifier moved to Kiev". ESPN. Press Association. 23 July 2014. Retrieved 15 May 2015.